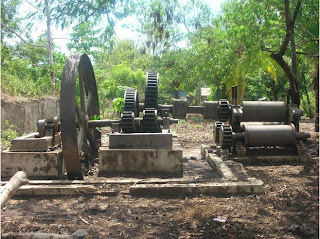 Before the existence of the modern sugar centrals in Negros Island, there were the Mucovado mills. When I was little, it was not uncommon to see the "simborio" or smokestack of the old muscovado (brown) sugar mill found in large sugar plantations of the province. In the farms surrounding Silay City alone, from a distance I think I saw about 3 or 4 of them, grey stone structures which stood alone and imposing in the middle of unending fields of green. 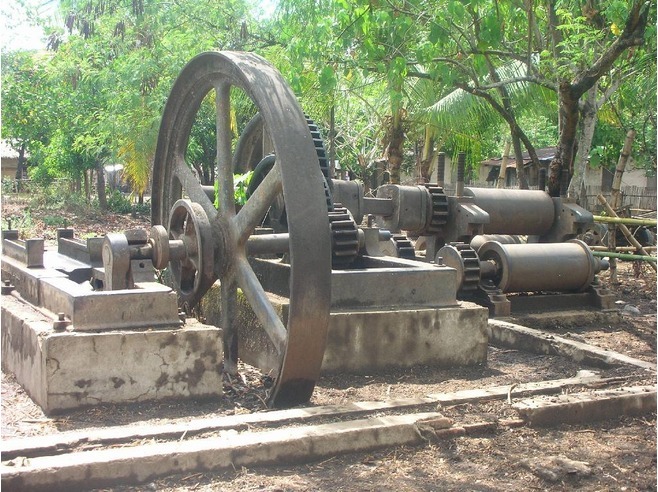 I remember asking my dad what they were and his simple answer was "old sugar mills". 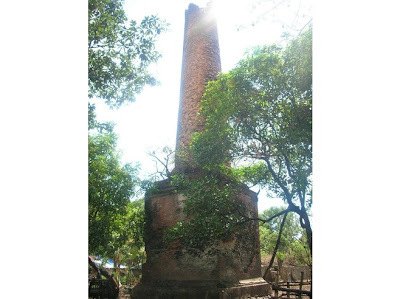 It was much later that I learned that they were part of a century-old technology of milling sugar, and were actually the smokestack or chimney part of the muscovado mill. In the old days, almost every plantation had it's own muscovado mill. It must have been cost-effected if not energy-efficient since most of the owners had really large plantations. Some smaller landowners also had mills but these were primitive in type and less efficiently run. 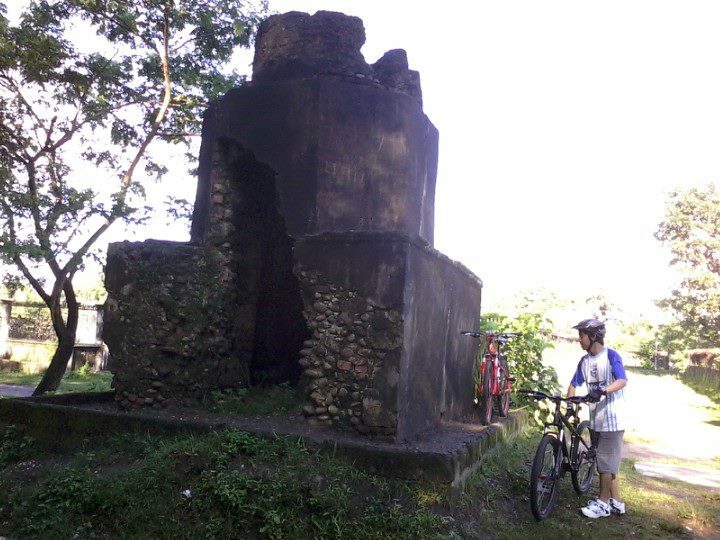 Today, however, these antique structures are not very visible anymore in the province. 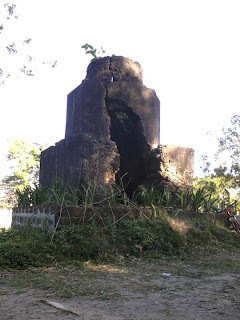 I can only guess that perhaps many have been destroyed to give way to modernization. I believe that LGU's, historical or heritage groups should document the few left standing in their respective areas so that these could be preserved and protected for it's important historical value in the evolution of Negros sugar. Among the many cities and municipalities of Negros, La Carlota City still has a relatively intact Muscovado mill in Hacienda Canman-ug, although this is no longer functional. Silay City has immortalized the muscovado simborio as there is a replica of it as one enters the city in the south boundary. This picture is the background of this blog. Of course, it is a stylized version but the symbolism for the city does not escape the viewer. 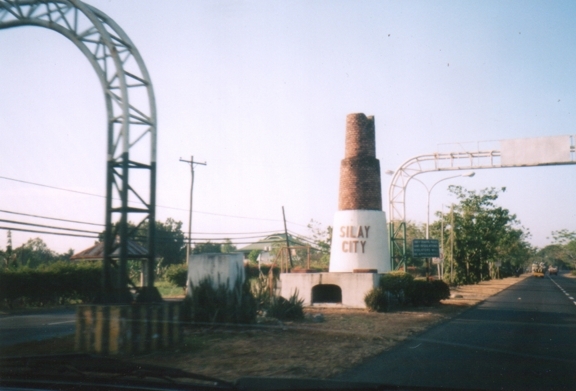 Silay, after all has one of the biggest group of families who migrated from Iloilo and who became big landowners of sugar plantations. So it was a very pleasant surprise to know that there was one right in my backdoor. A FB friend and a Silaynon took a picture of the ruins of a muscovado simborio that is still standing in Hda. Fortuna. It is ironic that nobody who lived in that area nor the owners of the farm has mentioned this or gave it much importance. I think this relic from the past should be properly documented. Who knows how many more unseen ruins are still in existence around the city? 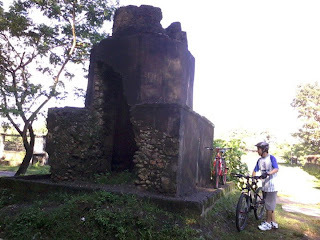 Maybe like the WWII pillboxes, this too could be included in our Silay walking tours.